The Logan-area coffee shop, Chairs Coffee, is opening another location in the former University Bar (or Bulldog), at the corner of Sharp and Hamilton. Ideally the shop will be open mid to late March, just in time for March Madness, co-owner Chris Nichols says. Chairs Coffee and Public House will serve Roast House coffee, local beer and liquor, Nichols says. (They applied for a liquor license last week.) They also plan to have live music and open mic nights. Nichols believes that the new location will fill a gap in the neighborhood business scene. Although there are other coffee shops, bars and restaurants in the area, Nichols says Chairs Coffee and Public House will offer everything under one roof. “We want to make sure that the students have awesome food, a little healthier than the normal bar,” he says. The hope is to renovate the interior, open up the ceilings and redo the floors, he says. The whole thing has moved quickly — Nichols and his partners saw the space for lease a week and a half ago. They called that day. Although it might seem hasty to some, Nichols says he's confident. 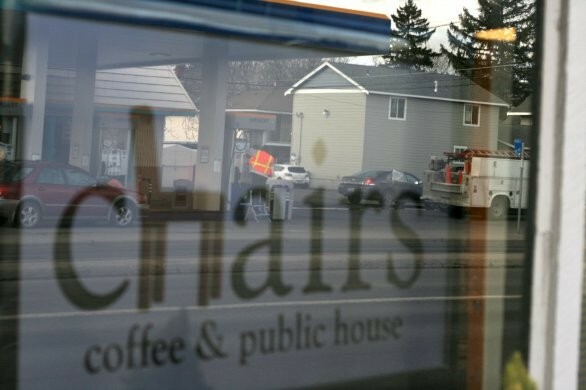 Chairs Coffee, a popular Logan-area coffee shop, is opening a new location closer to Gonzaga University.